If you cannot see the Army Card graphic, check Heroscapers Units Gallery Page. There is no information on this unit on the official Hasbro site. How does Frenzy work? Can I keep rolling for Frenzy if I get it on my first try? 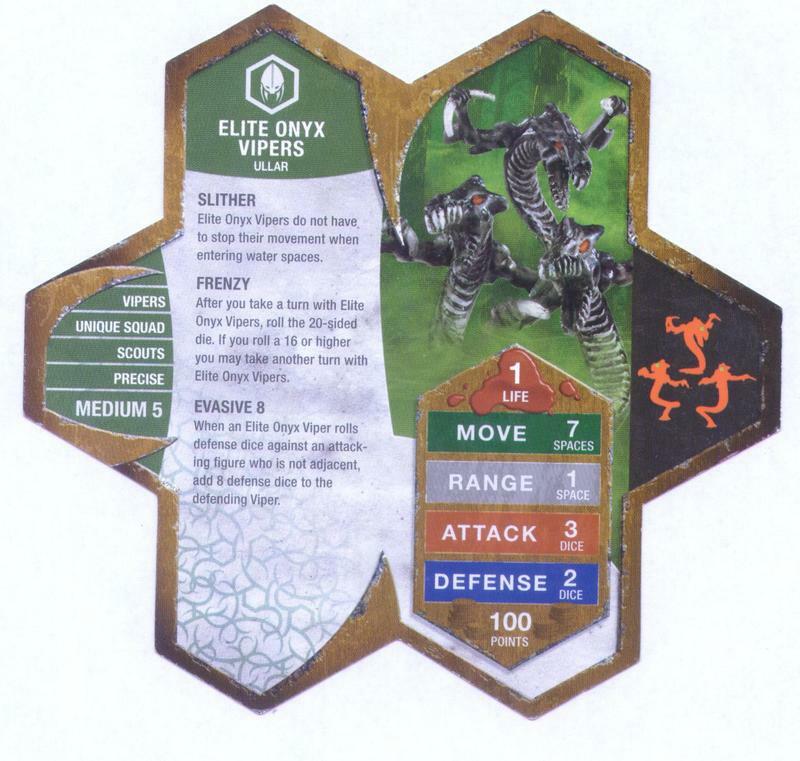 Does the Elite Onyx Vipers' special power Evasive 8 work against special attacks like: Airborne Elite's grenade attack, Deathwalker's explosion, and Mimring's Fire Line special? As a follower of Ullar, Elite Onyx Vipers may benefit from Acolarh’s ULLAR’S AMULET movement bonus. Having the Frenzy power, Elite Onyx Vipers may benefit from Venoc Warlord’s FRENZY ENHANCEMENT d20 bonus. As Scouts, Elite Onyx Vipers may benefit from Venoc Warlord’s SCOUT LEADERSHIP movement bonus. 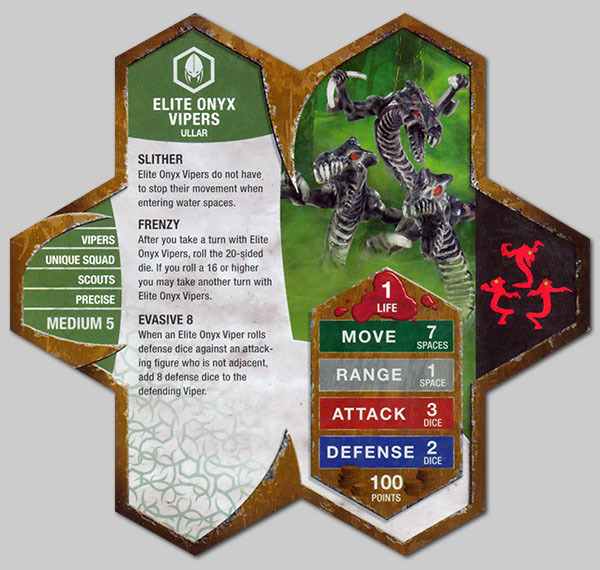 Elite Onyx Vipers may add one attack die when adjacent to Brave Arrow and attacking an adjacent figure. Note: These sculpts are from the Venoc Vipers, "Snipers and Vipers" set of Collection 1. Last edited by superfrog; March 12th, 2019 at 02:37 PM. Another thing to note about the EOV is that they are unique rather than common like all the other Viper squads. This means that they can be enhanced by the vikings' Spirit Auras. If you have the Venoc Warlord and drop Eldgrim's spirit on them these guys have a movement of 10; the fastest in the game and twice that of most squads. With a lucky frenzy roll you should be able to hit almost any spot on the map with them on their very first turn. You know, I haven't caught that yet - the spirits thing. I'll definitely have to use that next time... Backed by Raelin, and they would be a very formidable force on the field. I don't think Raelin would be able to keep up with these low-flying jets. With a defense of 10 against ranged figures I don't think they have much to worry about without being engaged and their massive movement insures that they should get first strike against other melee units. Another add-on I forgot to mention was Acolarh. If you have the EOV enhanced with Eldgrim, with the Venoc Warlord on your side, and starting next to Acolarh they have a move of 12 for their launch and a 10 for any follow up moves. Leave the Onyx Vipers back until you can move the 9 spaces (or 10-12 if you want to use Acolarh/Eldgrim) to get to a target (hopefully a single target or something the snakes should kill easily)... and when you hope to frenzy, you can always retreat with them as hit-and-run weapons, so it'd be best to try this strategy with the 3rd order marker, so that if you fail on the frenzy retreat, you might as well try the 1st order marker next round and just keep advancing and hopefully get lucky on your 2nd frenzy attempt. I guess you could try this with the Venoc Vipers as well, but with no defense, why retreat anyway? Their Precise personality throws me for a loop. All other Viper units have the Relentless personality. Does giving the EOV the same, dominant trait make them too potent when snuggling up to the Darklord? Love the idea of getting a viking champion spirit(s) on their card. I have an extra set that I'd be willing to trade. But pobably only for Sir Hawthorne seeing as how I have everything else already. Jeez if I had multiples of the exclusives, I'd be sure you and Guerillinator owned them. Good luck, D! I like the EOV's but i think their special ability to add 8 dice to their defense is a bit zany! Off Topic - dnutt, your avatar is freaking me out, more than Robaula's avatar ever did! XYPER THE HYPER VIPER SNIPER. But then Wal-mart demanded 3 exclusive figures instead of 1. They are precise. They're not a swarming, slashing, tearing unit that throws themselves forward to do as much damage as possible. They're an elite assassination unit, sliding in the darkness where they're hard to see until they reach their target and take them out. Once they've taken down their mark they rarely survive for long, but by then they've completed their mission anyway. I could see Tricky, even Disciplined, but Precise? Snuggling up against the oddly paired Khosumet might've made them too potent - hence the personality change? Miss you man... ...by the clacking sound of the D20 OF FATE! It's been a long while since I fielded some Frenzyers. I may need to pull them out at the next game. Do you think these vipers would be useful in hunting down those annoying Krav Magna Agents? "I only speak for myself"